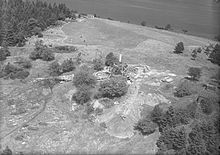 The Oak Island mystery refers to stories of buried treasure and unexplained objects found on or near Oak Island in Nova Scotia. Since the 19th century, a number of attempts have been made to locate treasure and artifacts. Theories about artifacts present on the island range anywhere from pirate treasure, to Shakespearean manuscripts, to even possibly the Holy Grail or the Ark of the Covenant, with the Grail and the Ark being buried there by the Knights Templar. Various items have surfaced over the years that were found on the island, some of which have since been carbon dated and found to be hundreds of years old. Although these items can be considered treasure in their own right, no significant main treasure site has ever been found. The site consists of digs by numerous people and groups of people. The original shaft, in an unknown location today, was dug by early explorers and known as "the money pit". "The Curse", is said to have originated more than a century ago and states that seven men will die in the search for the treasure before it is found. To date six men have died in their efforts to find the treasure. Very little verified information is known about early treasure-related activity on Oak Island. It wasn't until decades later that publishers began to pay attention to the activity, and investigated the stories involved. The earliest known story of a treasure find by a settler named Daniel McGinnis first appeared in print in 1856, while excavation information regarding the Onslow and later Truro Company weren't published until the early 1860s. A lot of the following early accounts are thus word of mouth stories going back to the late eighteenth-century. The first of these stories by early settlers involve a dying sailor from the crew of Captain Kidd (d. 1701), in which he states that treasure worth £2 million had been buried on the island. According to the most widely-held story, Daniel McGinnis discovered a depression in the ground around 1799 while he was looking for a location for a farm. McGinnis, who believed that the depression was consistent with the Captain Kidd story, sought help with digging. With the assistance of two men identified only as John Smith and Anthony Vaughn, he excavated the depression and discovered a layer of flagstones two feet below. According to later accounts, oak platforms were discovered every 10 feet (3.0 m); however, the earliest accounts simply mention "marks" of some type at these intervals. The accounts also mentioned "tool marks" or pick scrapes on the walls of the pit. The dirt was noticeably loose, not as hard-packed as the surrounding soil. The three men reportedly abandoned the excavation at 30 feet (9.1 m) due to "superstitious dread". Another twist on the story has all four people involved as teenagers. In this rendering McGinnis first finds the depression in 1795 while on a fishing expedition. The rest of the story is consistent with the first involving the logs found, but ends with all four individuals giving up after digging as much as they could. In either case word spread fast as by 1801 another man named Gordan Chase attempted to find the treasure. Chase ended any more future attempts after he was wounded by another treasure hunter named Micheal J Whynot, it is unknown if either man found anything of value. In 1802 (est. ), a group known as the Onslow Company sailed from central Nova Scotia to Oak Island to recover what they believed to be hidden treasure. [a] They continued the excavation down to about 90 feet (27 m), with layers of logs (or "marks") found about every ten feet (3.0 m), and also discovered layers of charcoal, putty and coconut fibre. According to an 1862 account, at 80–90 feet (24–27 m) they recovered a large stone inscribed with symbols. The diggers then faced a dilemma when the pit flooded with 60 feet (18 m) of water from unknown reasons. The excavation was eventually abandoned after workers attempted to recover the treasure from below by digging a tunnel from a second shaft that also flooded. Another company called The Truro Company was formed in 1849 by investors who re-excavated the shaft back down to the 86-foot (26 m) level, but the pit then flooded again. It was then decided to drill five bore holes using a pod-auger into the original shaft. According to a nineteenth-century account, the auger passed through a spruce platform at 98 feet (30 m). After this platform, the auger hit layers of oak, something described as "metal in pieces", another spruce layer, and clay for 7 feet (2.1 m). This platform was hit twice each time metal was brought to the surface along with various other items such as wood and coconut fiber. The initial McGinnis excavation first appeared in the Liverpool Transcript in October 1856. The first published account, which mentioned a group digging for Captain Kidd's treasure on Oak Island, was published the following year. A more complete account, by a justice of the peace in Chester, Nova Scotia then followed in the Liverpool Transcript. The account based on the Liverpool Transcript articles also ran in the Novascotian, the British Colonist, and is mentioned in an 1895 book called A History Of Lunenburg County. In early 2000, investigator Joe Nickell reviewed the original accounts and interviews with descendants of McGinnis and the original Oak Island landowners. While later sources state that the treasure had been discovered by three young boys, Nickell reported that the story was about three adult lot owners who discovered the depression on the island and began digging. The next major excavation attempt was carried out in 1861 by a company called "The Oak Island Association". The original pit was re-excavated to a depth of 88 feet, and two more shafts were dug. The first one missed its intended target of an alleged flood tunnel, while the other intersected the original shaft via a branched off tunnel at around 105 feet deep. Both of these shafts were filled with water when an alleged flood tunnel was again breached. At one point one of the platforms placed in the original shaft at 98 feet collapsed, and dropped to a lower level. The effect caused the next two platforms to drop as well with the treasure now resting some 119 feet below ground along with an estimated 10,000 feet of lumber. The first of six accidental deaths during excavations occurred during the fall of 1861 when a pump engine boiler burst. The explosion was first mentioned in an 1863 novel titled "Rambles among the blue-noses", while mention of a death came five years later. Another shaft was dug in the spring of 1862, which was 107 feet deep. This new shaft was parallel and connected to the original shaft as it was used to pump water out of the original shaft to a depth of 103 feet. Although the pumps could not keep up with the floodwater, tools that were used by the Onslow and Truro companies were recovered. The Oak Island Association also did some work at Smith's Cove by drilling a few shafts in an attempt to shut off and seal the alleged flood tunnels. All of these attempts were failures in the end due to the tide which eventually broke through barriers that were put in place. One final attempt was made in 1864 to intersect the money pit which resulted in an alleged flood tunnel again being breached. By this time saltwater was undermining the walls of the original shaft which some workers refused to enter. The original shaft was inspected by mining engineers who declared it unsafe, and the company abandoned their efforts when their money ran out. In 1866, a group known as The Oak Island Eldorado Company or more commonly The Halifax Company was formed to find the treasure. By this time there were many shafts, bore holes, and tunnels under Oak Island by previous treasure hunters. When a plan to shut off the alleged flood tunnels from Smith's didn't work, the company decided to shift focus to the original main shaft. Exploratory holes were drilled that turned up bits of wood, more coconut fiber, soft clay, and blue mud. The group gave up the search in 1867 having found nothing of interest. In 1896, an unknown group arrived on the island with steam pumps and boring equipment. Although the pumps were unable to keep water out of the flooded side shaft, boring samples were taken. It was claimed that one of the samples brought a tiny piece of sheepskin parchment to the surface. The parchment had two letters, "vi" or "wi", written in India ink. The second accidental death occurred on March 26, 1897 when a worker named Maynard Kaiser fell to his death. Red paint was poured into the flooded pit by the group in 1898, which reportedly revealed three exit holes around the island. Captain Henry L. Bowdoin arrived on Oak Island in August 1909 representing the Old Gold Salvage Group, one of whose members was Franklin Delano Roosevelt. By this time the area now known as the "money pit" was cleared out to 113 feet (34 m), and divers were sent down to investigate. Although multiple borings were taken in and around the pit, none of the cores revealed anything of interest. Bowdoin also examined Smith's Cove, where drain tunnels and a ring bolt in a rock had reportedly been seen. Although the group found the remains of an 1850 cofferdam, no evidence of anything else was found. Bowdoin later examined the "stone cipher" in Halifax, and found it a basalt rock with no symbols. He was doubtful that symbols could have worn off the rock, given its hardness. The group left the island in November 1909, but Roosevelt kept up with Oak Island news and developments for most of the rest of his life. In 1928, a New York newspaper published a feature story about Oak Island. William Chappell became interested and excavated the pit in 1931 by sinking a 12-by-14-foot (3.7 m × 4.3 m) 163-foot (50 m) shaft southwest of what he believed was the site of the 1897 shaft (which was thought, without evidence, to be near the original pit). At 127 feet (39 m), a number of artifacts, including an axe, a fluke anchor and a pick, were found. The pick was identified as a Cornish miner's pick, but by this time the area around the pit was littered with debris from previous excavation attempts and finding the owner was impossible. Gilbert Hedden, an operator of a steel fabricating company, saw the 1928 article and was fascinated by the engineering problems involved in recovering the reported treasure. Hedden made six trips to Oak Island and collected books and articles about the island. He went to England to consult Harold T. Wilkins, author of Captain Kidd and His Skeleton Island, about a link he found between Oak Island and a map in Wilkins' book. After Chappell's excavations, Hedden began digging in the summer of 1935, after he purchased the southeastern end of the island. In 1939, he informed King George VI about developments on the island. Further excavations were made in 1935 and 1936, none of which were successful. Robert Restall, his 18-year-old son, and workpartner Karle Graeser, came to Oak Island in 1959 after signing a contract with one of the property owners. In 1965, they tried to seal what was thought to be a storm drain in Smith's Cove and dug a shaft down to 27 feet (8.2 m). On August 17, Restall was overcome by hydrogen sulfide fumes. His son then went down the shaft, and also lost consciousness. Graeser and two others, Cyril Hiltz and Andy DeMont, then attempted to save the two men. A visitor to the site, Edward White, had himself lowered on a rope into the shaft but was able to bring out only DeMont. Restall, his son, Graeser and Hiltz all died. That year, Robert Dunfield leased portions of the island. Dunfield dug the pit area to a depth of 134 feet (41 m) and a width of 100 feet (30 m) by using a 70-ton digging crane with a clam bucket. Transportation of the crane to the island required the construction of a causeway (which still exists) from the western end of the island to Crandall's Point on the mainland, two hundred metres away. Dunfield's lease ended in August 1966. In January 1967, Daniel C. Blankenship, David Tobias, Robert Dunfield, and Fred Nolan formed a syndicate for exploration on Oak Island. Two years later, Blankenship and Tobias formed Triton Alliance after purchasing most of the island. Several former landowners, including Mel Chappell, became shareholders in Triton. Triton workers excavated a 235 feet (72 m) shaft, known as Borehole 10-X and supported by a steel caisson to bedrock, in 1971. According to Blankenship and Tobias, cameras lowered down the shaft into a cave recorded possible chests, human remains, wooden cribbing and tools; however, the images were unclear and none of the claims have been independently confirmed. The shaft later collapsed, and the excavation was again abandoned. 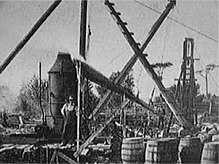 The shaft was later re-dug to 181 feet (55 m), reaching bedrock, but work was halted due to lack of funds and the collapse of the partnership. Divers sent to the bottom of Borehole 10-X in 2016 found no artifacts. An account of an excavation of the pit was published in the January 1965 issue of Reader's Digest. The island was the subject of an episode of In Search of... which was first broadcast on January 18, 1979. In 1983, Triton Alliance sued Frederick Nolan over the ownership of seven lots on the island and its causeway access. Two years later, Nolan's ownership of the lots was confirmed but he was ordered to pay damages for interfering with Triton's tourist business. On appeal, Triton lost again in 1989 and Nolan's damages were reduced. During the 1990s, further exploration stalled because of legal battles between the Triton partners and a lack of financing. In 2005, a portion of the island was for sale for US$7 million. Lot Five is currently owned by Robert S. Young of Upper Tantallon NS who purchased it from Frederick G. Nolan of Bedford, NS in June 1996. Although the Oak Island Tourism Society had hoped that the government of Canada would purchase the island, a group of American drillers did so instead. It was announced in April 2006 that brothers Rick and Marty Lagina of Michigan had purchased 50 percent of Oak Island Tours from David Tobias for an undisclosed sum. The rest of the company is owned by Blankenship. Center Road Developments, in conjunction with Allan Kostrzewa and Brian Urbach (members of the Michigan group), had purchased Lot 25 from David Tobias for a reported $230,000 one year before Tobias sold the rest of his share. The Michigan group, working with Blankenship, said that it would resume operations on Oak Island in the hope of discovering buried treasure and solving the island's mystery. In July 2010, Blankenship and the other stakeholders in Oak Island Tours announced on their website that the Nova Scotia Department of Natural Resources and Department of Tourism, Culture and Heritage had granted them a treasure-trove license which allowed them to resume activities until December 31, 2010. After December 2010, the departments repealed the treasure-trove license and replaced it with an Oak Island Treasure Act. The act, which became effective on January 1, 2011, allows treasure hunting to continue on the island under the terms of a license issued by the Minister of Natural Resources. Exploration by the Lagina brothers has been documented in a reality television show airing on the History channel starting in 2014. According to an account written in 1862, after the Onslow Company had excavated to 80–90 feet (24–27 metres) the pit flooded with seawater up to the 33-foot (10 m) level; attempts to remove the water were unsuccessful. Explorers have made claims about an elaborate drainage system extending from the ocean beaches to the pit. Later treasure hunters claimed that coconut fibres were discovered beneath the surface of a beach, Smith's Cove, in 1851. This led to the theory that the beach had been converted into a siphon, feeding seawater into the pit through a man-made tunnel. A sample of this material was reportedly sent to the Smithsonian Institution during the early 20th century, where it was concluded that the material was coconut fibre. Although one expedition claimed to have found a flood tunnel lined with flat stones at 90 feet (27 m), geologist Robert Dunfield wrote that he carefully examined the walls of the re-excavated pit and was unable to locate any evidence of a tunnel. At the invitation of Boston-area businessman David Mugar, a two-week survey was conducted by the Woods Hole Oceanographic Institution in 1995 (the only known scientific study conducted on the site). After running dye tests in the bore hole, the institution concluded that the flooding was caused by a natural interaction between the island's freshwater lens and tidal pressures in the underlying geology (refuting the man-made tunnel theory). The Woods Hole scientists who viewed the 1971 videos reported that nothing conclusive could be determined from the murky images. The reported five finger (or box) drains at Smith's Cove have recently been thought to be the remains of an early salt works, with no connection between the drains and any flooding of the pit. Oak Island lies on a glacial tumulus system and is underlain by a series of water-filled anhydrite cavities, which may be responsible for the repeated flooding of the pit. This type of limestone easily dissolves when exposed to water, forming caves and natural voids. Bedrock lies at a depth of 38 to 45 metres (125 to 148 feet) in the pit area. A stone found 90 feet below the surface was said to have been inscribed with "mysterious markings." It was first reported in a July 2, 1862, Halifax Sun and Advisor article, which mentioned a June 2, 1862, letter by J. B. McCully which retold the story of the stone. Offering a secondhand description of its discovery during the early 1800s excavation, McCully wrote: "Some [layers] were charcoal, some putty, and one at 80 feet was a stone cut square, two feet long and about a foot thick, with several characters cut on it." In an 1863 newspaper article, the stone was said to have been built into the "chimney of an old house near the pit". Another article, a year later, claimed that the stone was held by the Smith family. On January 2, 1864, Historical Society of Nova Scotia secretary John Hunter-Duvar contacted treasure hunter George Cooke. In a January 27, 1864, letter to Hunter-Duvar, Cooke claimed that Smith built the stone into his chimney in 1824 and said that he was shown the stone by Smith in the chimney around 1850, when "there were some crudely cut letters, figures or characters upon it. I cannot recollect which, but they appear as if they had been scraped out by a blunt instrument, rather than cut with a sharp one." According to Cooke, when he made inquiries in 1864, he discovered that the chimney had been enclosed in wood and surrounded by a staircase; the stone was no longer visible. An undated post-1893 letter by William Blair read, "Jefferson W. McDonald, who first mentioned Oak Island to me in 1893, worked under George Mitchell. Mr. McDonald, who was a carpenter by trade, also told of taking down a partition in Smith's house, in order that he with others might examine the characters cut on the stone used in the fireplace in the house. The characters were there all right, but no person present could decipher them." Mitchell was the superintendent of works for the Oak Island Association, which was formed on April 3, 1861, and ceased operation by March 29, 1865. In his 1872 novel, The Treasure of the Seas, James DeMille describes being a summer resident of Chester Basin during the later 1860s. DeMille lived on Oak Island for a summer and had firsthand knowledge of the area. The characters in the novel find that the stone had been removed from the chimney when they arrived on the island; until then, no one had been able to decode the mysterious symbols reportedly on the stone, which an inn landlord describes as 'rather faint, and irregular' — he also says that 'men who don't believe in Kidd's treasure ... say that it isn't an inscription at all ... it's only some accidental scratches'. Reginald Vanderbilt Harris (1881–1986) wrote in his 1958 book, The Oak Island Mystery, "About 1865–1866 the stone was removed and taken to Halifax. Among those who worked to remove the stone was Jefferson W. MacDonald." The Blair letter mentioned above states that MacDonald took down the partition in order to examine the stone, not to remove it. Harris provides no source for the claim that the stone was removed in 1865 or 1866. The next mention of the stone is in an 1893 Oak Island Treasure Company prospectus. According to the prospectus, the stone was taken out of the chimney and moved to Halifax; there, an unnamed expert was said to have deciphered the stone as reading: "Ten feet below are two million pounds buried." The stone was shown to everyone who visited the Island in those days. Smith built this stone into his fireplace, with the strange characters outermost, so that visitors might see and admire it. Many years after his death, the stone was removed from the fireplace and taken to Halifax, where the local savants were unable to translate the inscription. It was then taken to the home of J.B. McCulley in Truro, where it was exhibited to hundreds of friends of the McCulleys who became interested in a later treasure company. Somehow the stone fell into the hands of a bookbinder, which used it as a base upon which to beat leather for many years. A generation later, with the inscription nearly worn away, the stone found its way to a bookstore in Halifax, and what happened to it after that I was unable to learn. But there are plenty of people living who have seen the stone. Nobody, however, ever seriously pretended to translate the inscription." He well remembered seeing the stone as a boy. "While in Creighton’s possession some lad had cut his initials ‘J.M.” on one corner, but apart from this there was no evidence of any inscription either cut or painted on the stone." Creighton used the stone for a beating stone and weight. When the business was closed in 1919, ... the stone was left behind. One researcher claimed that the cipher translated as "Forty feet below, two million pounds lie buried." The symbols associated with the "Forty feet below" translation first appeared in 1949's True Tales of Buried Treasure by explorer and historian Edward Rowe Snow. In his book, Snow said that he received the set of symbols from Rev. A. T. Kempton of Cambridge, Massachusetts, but no information was provided as to how or where Kempton obtained them. It was found that Kempton had stated in a letter dated April 1949 that he had obtained his information from "a school teacher long since dead". Franklin Delano Roosevelt, stirred by family stories originating from his sailing and trading grandfather (and Oak Island financier) Warren Delano, Jr., began following the mystery in late 1909 and early 1910. Roosevelt continued to follow it until his death in 1945. Throughout his political career, he monitored the island's recovery attempts and development. Although the president secretly planned to visit Oak Island in 1939 while he was in Halifax, fog and the international situation prevented him from doing so. Australian-American actor Errol Flynn invested in an Oak Island treasure dig. Actor John Wayne also invested in the drilling equipment used on the island and offered his equipment to be used to help solve the mystery. William Vincent Astor, heir to the Astor family fortune after his father died on the Titanic, was a passive investor in digging for treasure on the island. Rear Admiral Richard E. Byrd, Jr. was also a passive investor in Oak Island exploration and treasure hunting, and monitored their status. Byrd advised Franklin D. Roosevelt about the island; the men forged a relationship, forming the United States Antarctic Service (USAS, a federal-government program) with Byrd nominally in command. Wide-ranging speculation exists about how the pit was formed and what it might contain. According to Joe Nickell, there is no treasure; the pit is a natural phenomenon, probably a sinkhole connected to limestone passages or caverns. Suggestions that the pit is a natural phenomenon (accumulated debris in a sinkhole or geological fault) date to at least 1911. A number of sinkholes and caves, to which the "booby traps" are attributed, exist on the mainland near the island. Its resemblance to a human-made pit has been suggested as partly due to the texture of natural, accumulated debris in sinkholes: "This filling would be softer than the surrounding ground, and give the impression that it had been dug up before". The "platforms" of rotten logs have been attributed to trees, damaged by "blowdowns" (derechos) or wildfires, periodically falling (or washing into) the hollow. Another pit, similar to the early description of the "money pit", was discovered in the area in 1949 when workmen were digging a well on the shore of Mahone Bay. At a point where the earth was soft, "At about two feet down a layer of fieldstone was struck. Then logs of spruce and oak were unearthed at irregular intervals, and some of the wood was charred. The immediate suspicion was that another money pit had been found." According to the earliest theory, the pit held a pirate treasure buried by Captain Kidd; Kidd reportedly conspired with Henry Avery, and Oak Island was their community bank. Another pirate theory involved Edward Teach (Blackbeard), who said that he buried his treasure "where none but Satan and myself can find it." An additional proposed explanation is that the pit was dug by Spanish sailors to hold treasure from a wrecked galleon or British troops stationed there during the American Revolution. Others claim that British marines dug the pit to store the loot acquired from the British invasion of Cuba, valued at about £1,000,000 pounds (about $180,000,000 in 2015). John Godwin wrote that given the apparent size and complexity of the pit, it was probably dug by French Army engineers hoping to hide the treasury of the Fortress of Louisbourg after it fell to the British during the Seven Years' War. Marie Antoinette's jewels, missing except for specimens in museum collections, have been reportedly hidden on the island. On October 5, 1789, an angry mob of Parisian working women was incited by revolutionaries and marched on the Palace of Versailles. According to the undocumented story, Marie Antoinette instructed her maid (or a lady-in-waiting) to take the jewels and flee. The maid fled to London with the jewels and (perhaps) other treasures, such as artwork or documents, secreted on her person or in her luggage. The woman then fled from London to Nova Scotia. Using royal connections, she contracted with the French Navy to construct the Oak Island pit. In late 2017 the first possible evidence of this theory seemed to have been validated by the discovery of a 500-year-old brooch containing a large garnet. In his 1953 book, The Oak Island Enigma: A History and Inquiry Into the Origin of the Money Pit, Penn Leary wrote that the pit was used to hide manuscripts indicating that Francis Bacon was the author of William Shakespeare's works and a leader of the Rosicrucians. Leary's "The Second Cryptographic Shakespeare", published in 1990, identified ciphers in Shakespeare's plays and poems which pointed to Bacon's authorship. Author and researcher Mark Finnan elaborated on Leary's Oak Island theory, which was also used in the Norwegian book Organisten (The Seven Steps to Mercy) by Erlend Loe and Petter Amundsen and the TV series Sweet Swan of Avon. In his book, Oak Island Secrets, Mark Finnan noted that many Masonic markings were found on Oak Island, and the shaft (or pit) and its mysterious contents seemed to replicate aspects of a Masonic initiation rite involving a hidden vault with a sacred treasure. Joe Nickell identifies parallels between Oak Island accounts, the "Secret Vault" allegory in York Rite Freemasonry and the Chase Vault on Barbados. Freemason Dennis King examines the Masonic aspects of the Oak Island legend in his article, "The Oak Island Legend: The Masonic Angle". Steven Sora speculated that the pit could have been dug by exiled Knights Templar and might be the final resting place of the Holy Grail or the Ark of the Covenant. Author Joy Steele suggests that the money pit is actually a tar kiln dating to the historical period when "Oak Island served as a tar-making location as part of the British naval stores industry". When marine biologist Barry Fell attempted to have the symbols on the stone translated during the late 1970s, he said that the symbols resembled the Coptic alphabet and read: "To escape contagion of plague and winter hardships, he is to pray for an end or mitigation the Arif: The people will perish in misery if they forget the Lord, alas." According to Fell's theory, Coptic migrants sailed from North Africa to Oak Island and constructed the pit. However, Fell is not considered to be credible by most mainstream academics. ^ No original documents relating to the Onslow Company have ever been found. It is known that the company roughly had its activity sometime in the early 1800s. ^ One of the "best" accounts of what happened with the Tauro Company later appeared in the "1893 Oak Island Treasure Company Investment Prospectus". ^ a b c d e f Nickell, Joe (March 2000). "The Secrets of Oak Island". Skeptical Inquirer. ^ a b c d e Forks, J.P. (August 20, 1857). "Correspondence". Liverpool Transcript. Liverpool, Nova Scotia: S. J. M. Allen. p. 2. Archived from the original on February 3, 2014. Retrieved January 26, 2014. , referring to letter in previous edition - Forks, J.P. (August 13, 1857). "Correspondence". Liverpool Transcript. Liverpool, Nova Scotia: S. J. M. Allen. p. 2. Retrieved April 15, 2018. - these two letters give no details of the history of the diggings. ^ a b Phy, Paul (February 19, 1863). "Oak Island – The Reasons for expecting there is Treasure there". Yarmouth Herald. column 4. p. 1. Retrieved April 10, 2018. ^ Shirley Raye Redmond (March 18, 2011). Oak Island Treasure Pit. Greenhaven Publishing LLC. p. 6-8. Retrieved December 14, 2018. ^ "The Legend". www.oakislandtreasure.co.uk. Retrieved December 14, 2018. ^ Murdoch, Beamish (1865). A History of Nova-Scotia, Or Acadie. Vol. I. Halifax: J. Barnes. ^ a b "The Onslow Company". Oak Island Tours. Retrieved January 4, 2019. ^ "Oak Island Treasure – the world's greatest treasure hunt". Archived from the original on May 27, 2014. Retrieved May 26, 2014. ^ a b c d "The Truro Company". Oak Island Tours. Retrieved January 28, 2019. ^ "The Oak Island Folly". Liverpool Transcript. column 5. August 29, 1861. p. 2. Retrieved April 10, 2018. - gives no details of the history of the diggings. ^ Patrick. "Response to the Oak Island Folly." (11-13/130), September 30, 1861 - gives details of the Onslow and Truro companies - does not mention the inscribed stone. ^ A Member. "A History of The Oak Island Enterprise." (14-22/130) British Colonist (in 3 chapters published on January 2 (Onslow Company), 7 (Truro Company), and 14, 1864) - the inscribed stone "was preserved in the family of Mr. Smith it may be seen by the curious at the present day"
^ a b DesBrisay, Mather Byles (1895). History of the county of Lunenburg (2 ed.). Toronto: William Briggs. p. 300. ^ a b c d "The Oak Island Association". Oak Island Tours. Retrieved January 29, 2019. ^ Andrew Learmont Spedon (1863). Rambles among the blue-noses; or, Reminiscences of a tour through New Brunswick and Nova Scotia, during the summer of 1862. John LovellZ. p. 156. Retrieved January 29, 2019. ^ McIntee, David (2016). Fortune and Glory: A Treasure Hunter's Handbook. p. 91. ^ Lionel and Patricia Fanthorpe (2012). The Oak Island Mystery: The Secret of the World's Greatest Treasure Hunt. Dundurn. p. 73-74. Retrieved January 31, 2019. ^ "The Oak Island Eldorado Company". Oak Island Tours. Retrieved January 31, 2019. ^ Lamb, L. (2006). Oak Island Obsession: The Restall Story. p. 207. ^ "Scanned copy of the original Reader's Digest article" (PDF). Oakislandtreasure.co.uk. Archived from the original (PDF) on October 2, 2011. Retrieved October 15, 2010. ^ Whipps, Heather. "For Sale: Island with Mysterious Money Pit". Retrieved December 5, 2005. ^ "Treasure Trove License granted!". Oak Island Treasure. Archived from the original on August 8, 2011. Retrieved November 8, 2010. ^ Medel, Brian (July 15, 2010). "Treasure hunter hopes new law clears path to gold" Province to replace old rules with Oak Island Act". Halifax Chronicle Herald. ^ "Oak Island Treasure Act". nslegislature.ca. ^ Joltes, Richard (August 2002). "Appendix: Woods Hole Explores Oak Island". CriticalEnquiry.org. p. 1. Retrieved March 20, 2010. ^ King, Dennis (February 2010). "A Solution To The Mystery Of The Oak Island Five Finger Drains". CriticalEnquiry.org. Retrieved November 16, 2014. ^ "Canadian Newspapers on Microfilm – 2013 Catalog" (PDF). Common Wealth Imagining. Archived from the original (PDF) on February 10, 2015. Retrieved February 24, 2017. ^ Vanderbilt Harris, Reginald. "The Oak Island Mystery". Toronto Public Library. McGraw-Hill Ryerson, 1967. ^ Driscoll, Charles B. (1929). The Oak Island Treasure. p. 685. ^ "Statement of Harry W. Marshall". ^ "History, Hoax, and Hype The Oak Island Legend". www.criticalenquiry.org. Retrieved December 10, 2018. ^ "Treasure Hunters in Nova Scotia". US National Archives. ^ Roosevelt:, Franklin D. "White House Letter – August 24th, 1939". Heritage Auctions. ^ "Oak Island Money Pit". Atlas Obscura. ^ a b Boren, Kerry Ross Boren & Lisa Lee (2000). Following the Ark of the Covenant : The Treasure of God. US: Bonneville Books. p. 199. ISBN 1555174930. ^ "Richard E. Byrd". Virginia Historical Society. ^ "Byrd Antarctic Expedition III". South Pole. ^ This section follows Nickell, section "Man-made or Natural?". ^ Bowdoin, H. L. 1911. Solving the mystery of Oak Island. Collier's Magazine, August 18. Cited and discussed in Harris 1958, 110–120; O'Connor 1988, 63–66. ^ Faribault, E. Rudolph. 1911. Summary Report of Geological Survey Branch of the Department of Mines. Quoted in Furneaux 1972, 110. ^ a b Atlantic Advocate. 1965. Article in October issue, cited in Crooker 1978, 85–86. ^ Bonnier Corporation (May 1939). Popular Science. Bonnier Corporation. pp. 234–35. ISSN 0161-7370. ^ D'Arcy O'Connor (2004). The Secret Treasure of Oak Island: The Amazing True Story of a Centuries-Old Treasure Hunt. Globe Pequot Press. p. 140. ISBN 978-1-59228-279-1. ^ Leary, Penn (1991). "The Second Cryptographic Shakespeare". Westchester House Publishers. Archived from the original on October 31, 2014. Retrieved November 3, 2014. ^ King, Dennis (May 12, 2010). "The Oak Island Legend: The Masonic Angle". CrititalEnquiry.org. Retrieved November 16, 2014. ^ Ronnstam, Daniel. "The Duel Cipher". The Oak Island Project. ^ "Oak Island mystery: Its history is the real treasure". The Chronicle Herald. Retrieved December 30, 2015. Look up money pit in Wiktionary, the free dictionary. CBC Television "Dan Blankenship, treasure seeker"
CBC Television "The Oak Island money pit: how it works"
CBC Radio conversation "Nova Scotia's Oak Island mystery"
CBC Radio conversation "Engineer proposes freezing method to extract Oak Island treasure"
Dunning, Brian (November 25, 2008). "Skeptoid #129: The Oak Island Money Pit". Skeptoid.